I was impressed by the effort that Ankur put into his answer to my question "Bringing items into China for a friend - what to expect at customs? ", so I created a bounty so that I could award extra reputation as a way of thanking him for his help. Is this really necessary, seeing as how I started the bounty specifically to award it to an existing answer? This question came from our discussion, support, and feature requests site for road warriors and seasoned travelers. The bounty system is specifically made to draw attention to a question and rub people the right way into answering it. The reason there is a period in which the bounty cannot be awarded is to allow people to spend some time into providing a great answer -- which sometimes requires some thought and research. If a bounty is awarded quickly, it discourages other potentially better answers -- people would be significantly less inclined to provide a great answer to a question for which the bounty has already been awarded. Another reason for some seemingly unnecessary restrictions on the bounty system (i.e. bounty amounts, maximum number of outstanding bounties at any particular time, bounty times etc.) are there to prevent abuse, for example continuously transferring some of your rep to a buddy of yours. Adding a bounty after a great answer has been posted is perfectly okay, but there's no way for the system to "know" that you intend to slap your bounty on an already existing post -- besides, this would completely circumvent the 24-hour restriction, which is there for a reason. Here's a suggestion; for a "Reward Existing Answers" bounty, you should be able to select an answer immediately, which will result in your bounty automatically being awarded to that answer after the expiration of the timeout (or perhaps at the end of the bounty period). Given that the point of this type of bounty is explicitly to reward content that already exists, the primary purpose of the waiting period - to give people a chance to respond to the bounty by providing new content - is irrelevant. However, the secondary purpose of the waiting period, to draw attention to interesting content, would be undermined by this change, which is a shame, since this bounty identifies great content that's deserving of attention. Therefore, instead of a waiting period, there should be a period after the bounty is awarded (a week, I guess) during which "Reward existing answer"-bountied-questions remain on the "featured" list. Regarding the tertiary purpose of the waiting period, to prevent abuse such as rep transfer for its own sake, that could be addressed by treating the bounty as an "open" one while it's still on the "featured" list for the purpose of counting how many simultaneous open bounties a user has, thus limiting the velocity of such transfers. In fact, making this period a fixed minimum of more than a day for this type of bounty would actually make it even harder for users to use it serially to dump reputation on another user. 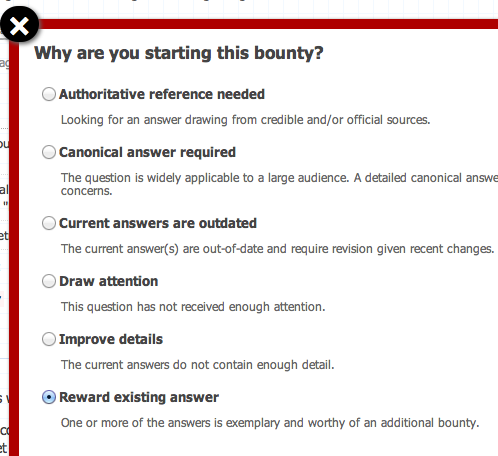 In addition, it would make sense to split the featured list into two, representing the two types of bounties: one for bounties that are open to solicit new answers, which would be associated with the "unanswered" or "needs answers" part of the site, and one for bounties that have been awarded to reward an existing answer, which would be associated with the "recommended" or "hot" part of the site. From the perspective of a bounty being advertising you've just 'paid' 50 reputation to increase visibility of the question and presumably excellent answer for at least a day. The poster might actually end up accruing extra reputation in the period. More practically I suspect that its also that special casing this sort of thing is a wee bit of work, and its the difference between having a single standard rule for all bounties, and a little extra logic that needs to be maintained for insta-bountying. Why do I have to wait to “tip” a user for a great answer via Bounty? I thought I can just give a bounty? no? Should we still have to wait the 24 hours if the Bounty reason is 'Reward Existing Answer'? What are the most effective ways to guide new users? Is it possible to offer two separate bounties for the same question by the same user simultaneously? Could it be easier to award a bounty to an existing answer?